RJ Stewart is creator and designer of two well-known tarot decks, The Merlin Tarot, and the Dreampower Tarot. He has been reading tarot since the late 1960s. The Merlin deck has been published in many editions since the 1980s, and translated into Japanese, French, German, and other languages. It is based on imagery found in the 12th century Merlin texts of Geoffrey of Monmouth, which predate the first known tarot decks by some three hundred years. 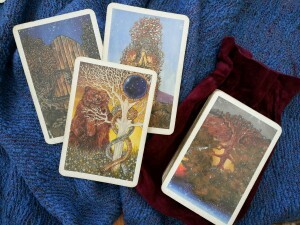 The Dreampower deck was published in 1991, and features a unique tarot of the UnderWorld and Earth Light, based on RJ’s books The UnderWorld Initiation, Earth Light, and Power Within the Land. RJ Stewart has been giving readings with these decks since they were first published, and has read for many people on subjects ranging from personal and spiritual advice to creative and business projects. His readings are a combination of work with one of his decks, Merlin or Dreampower, direct intuition, and seership. Readings usually last one hour, and can be recorded. 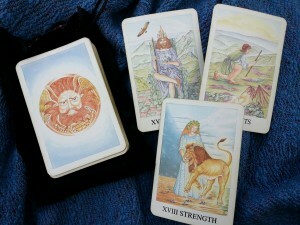 Pictures of cards are sent by email , plus any suggestions for meditation and other helpful information.